Sign up. Red entries are drawings, Green are lines. 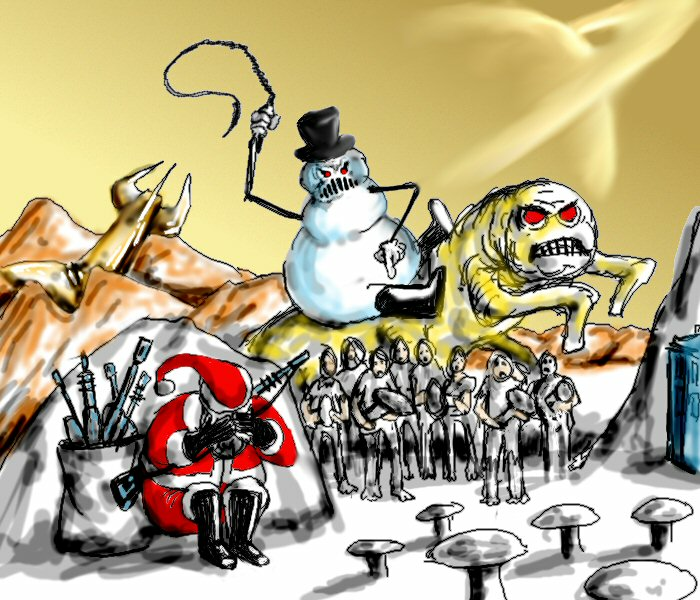 The Results: "On the 25th day of Telepic, Spamusement gave to me..."
Frosty was pissed. "That's it Santa," he shouted. "Make a choice, fat boy. It's either me, or the limbless Pillsbury Doughboy. We can't both be your best friend." 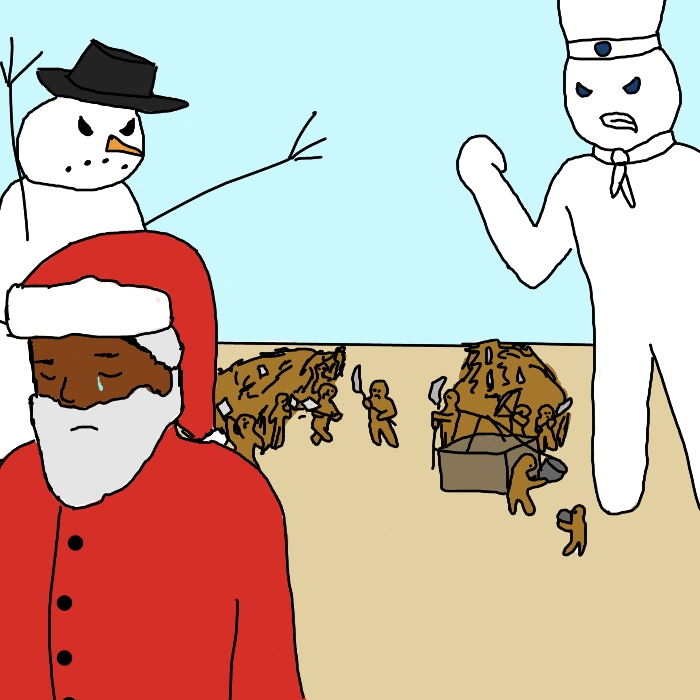 Black French Santa looks on with a single tear at the war between Frosty and the Pillsbury Dougboy's gingerbread hordes. 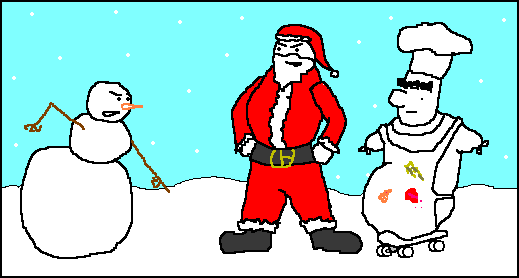 The battle between the forces of Snowman and the Pillsbury Doughboy was bruttle. 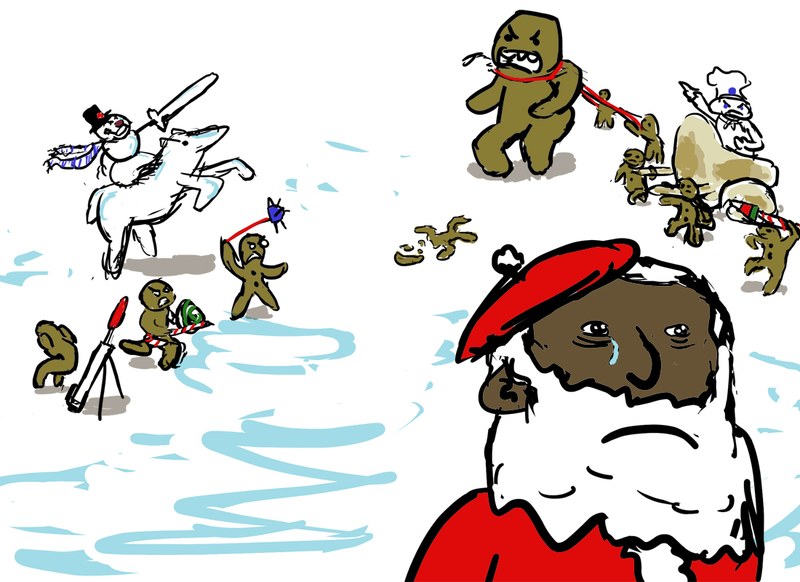 As gingerbread man turned against gingerbread man, black Scottish Santa turned away, shedding a single tear. When would the killing end? 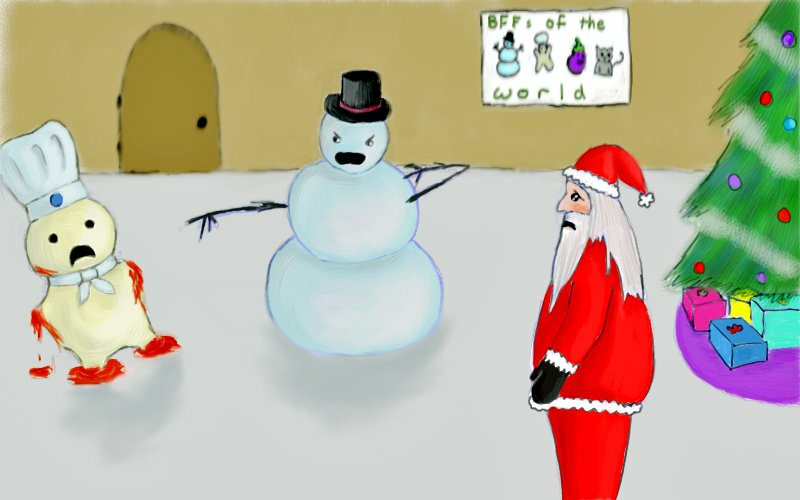 After a heavily armed Santa crashed into the mountains in his spaceship, he played a deadly game of Hide-and-Go-Seek with a demonic snowman (who rode a demonic, pie-faced, slug-like caterpillar with sleeves which were clearly too long for it). The lives of a multitude of mushroom gatherers were held in the balance. If only they'd notice the TARDIS not 10 feet from them, they could break free of their bonds. 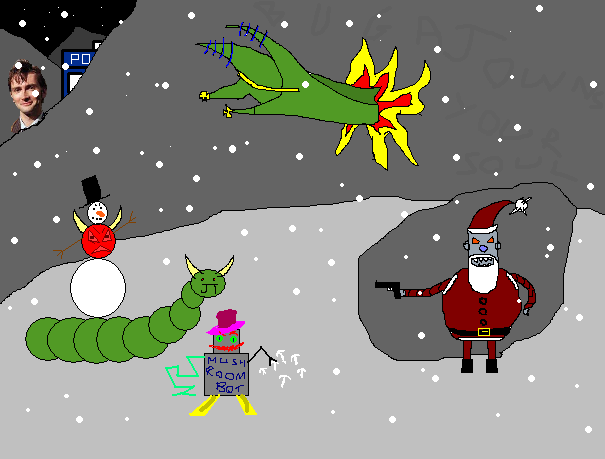 Robot Santa is going to kill all old video games--like centipede with robot mushrooms--and I think that's Dr. Who watching; there's an evil snowman involved too. 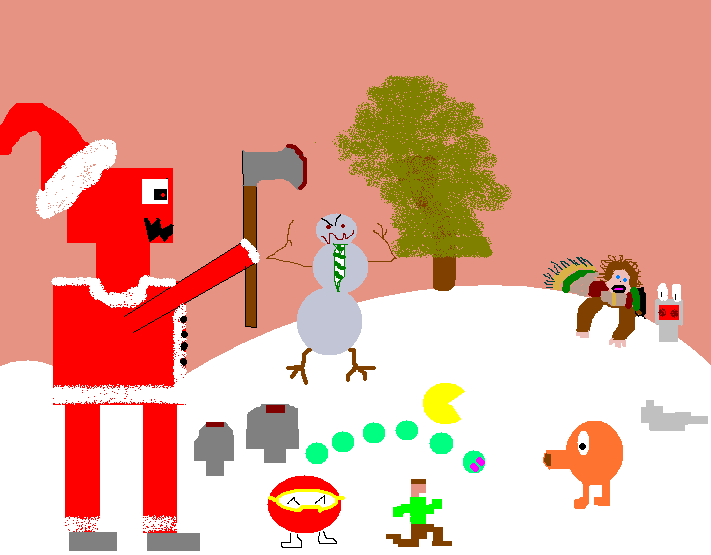 all of the 8bit characters assembled in the snowy field... pac man, anonymous running blocky dude, that egg-shooting first bad guy from Mario 2, the abominable snowman from that windows 3.1.1 skiing game that eats you at the end, umm... peacock-ape? murderous santabot? 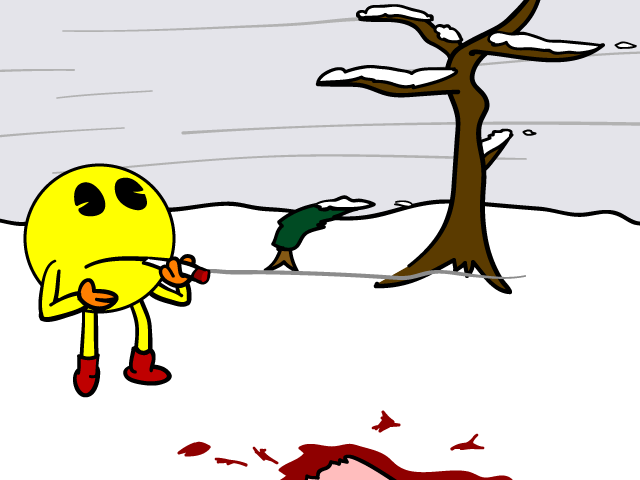 The chilling wind matched the temperature of Pac Man's soul. As he lazily puffed his joint, he looked out on the barren tundra and wondered just how he had sunk so low. 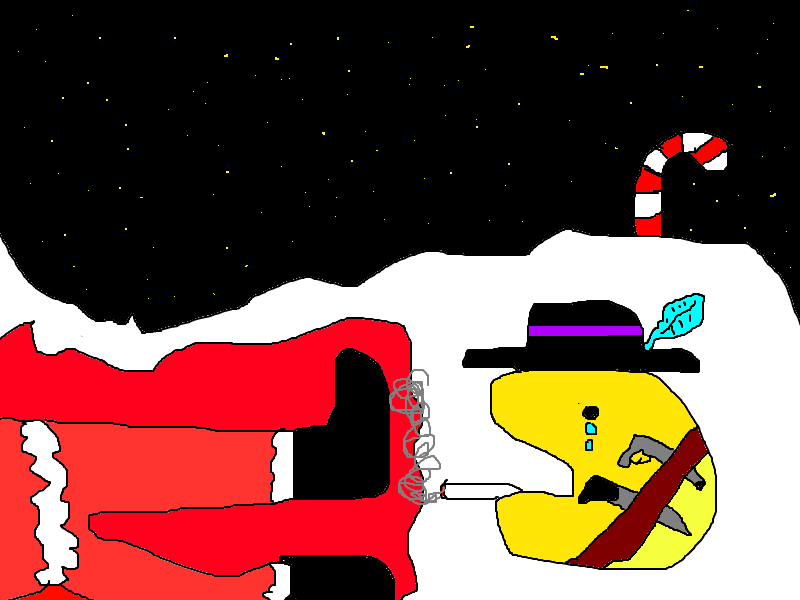 He didn't start out his life as a hit man, and the jolly old man just didn't deserve it.